It’s been an unbelievable spoonbill season this year! 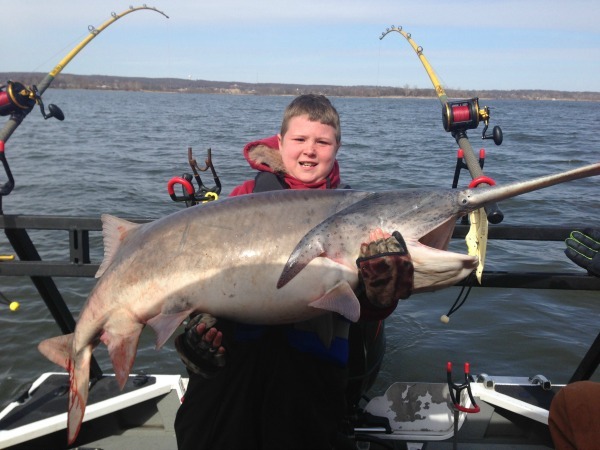 We’ve put around 550 spoonbill in the boat and 86 pounds being the biggest so far! The fish are sticking out in the lake area longer than usually with the colder than normal temps we had the last few weeks. I’ve been focusing in the Sailboat Bridge area to Patricia Island. Still running 3 pounds of weight and running around 4.5mph. I look for the fish to start pushing up the river system in the next few weeks. Ran a catfish trip last Monday with pretty good luck! There is still a small shad kill going on and the fish were still pretty finicky. We were still running the winter pattern fishing deep in the main river channel where the shad are present. I use 5/0 and 8/0 Team Catfish Double Action hooks with cut shad. The shad are still running fairly deep during the day but that will change in the coming days and be easy to get in the daylight hours. I also look for the blues to push up onto the flats on the sunny windy days. I like the Greys Ranch area flats this time of year and don’t be scared to fish up in 2-4 feet of water this time of year – I think you might be surprised what you’ll find up that shallow! Been hearing some really good reports of white bass being caught up both the Neosho and Spring Rivers! Fle Fly Go Go minnows in 2″ would be excellent choices to use up there right now! You can troll or cast for them right now and with the warmer weather coming in next week it ought to be on fire!! We have 47 trips booked this month but we have some open dates for April if your looking for an awesome spoonbill trip! Give me a call at 918-964-174 and make sure to checkout my website at www.rustypritchardoutdoors.com. If your on Facebook come friend me on there under Rusty Pritchard and see our catches everyday! !